I seldom give "excellent" rating for my tripadvisor review, my highest review score usually "very good". However, having stayed in Sheraton Bandung Hotel & Towers (this is a featured post, please see disclaimer below), I gave my tripadvisor review on Sheraton Bandung an "excellent" rating. For our family, Sheraton Bandung succeeded to get the title of "The Best Family Hotel in Bandung". There are lot of things why this hotel deserve such a title. The check-in was a breeze, Miss Isma, a very helpful and friendly staff of Towers Lounge reminds us before leaving the lounge, "Please join our evening cocktails starting 4 pm at the Towers Lounge". An evening cocktails from 4pm-7pm was also included in our room reservation. Yeay! Our room located only few meters away from the lounge, it was handy as we could go to the lounge anytime we like. We went to the Towers Lounge for our evening cocktails at 5 pm, there were only few people inside. 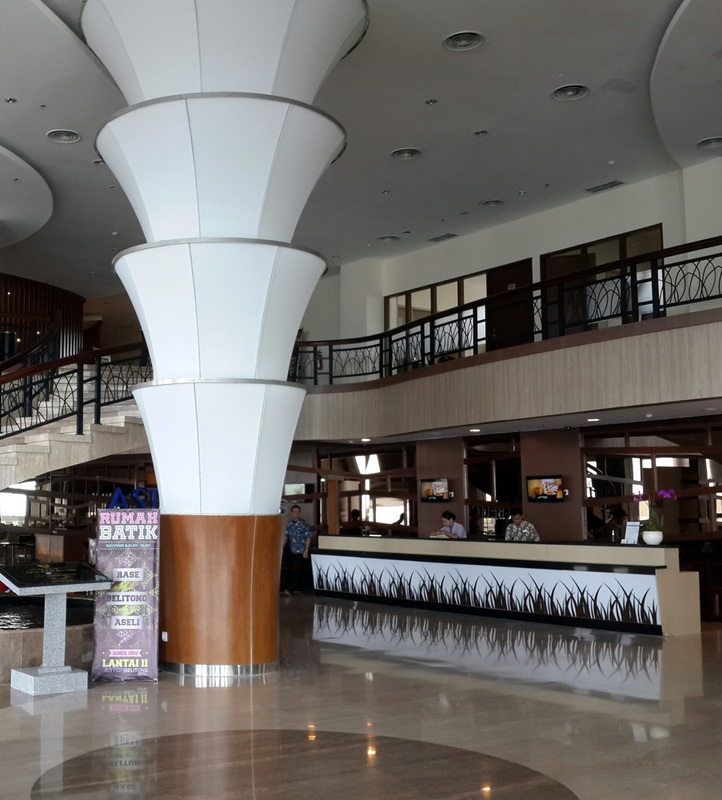 On our weekend getaway at Sheraton Hotel & Towers Bandung (this is a featured post, please see the disclaimer below), we arrived before lunch time and found the traffic jam had already started in Bandung. So was the Dago area, where Sheraton Bandung is located. I guess it was because that Saturday was the last day of school for the first semester, where parents go to school to take the student's report. So we decided to stay at the hotel for our lunch. We choose to eat at Feast Restaurant as it provides lunch buffet overlooking the pool area. 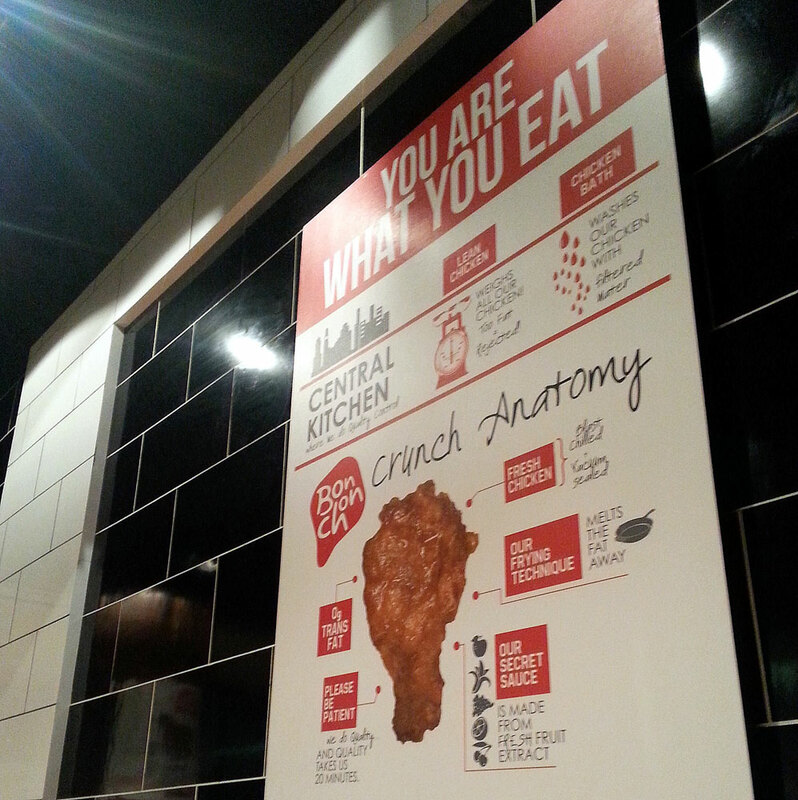 When we entered the restaurant, we were amazed with the variety of food provided, there were so many food inside! Not only me and Rene who were surprised, our kiddos were happy to see the kids station serving ice cream, candies, cakes, marshmallow and a tower of lollipops! "I want ice cream", kiddos request even before we decided where to sit. 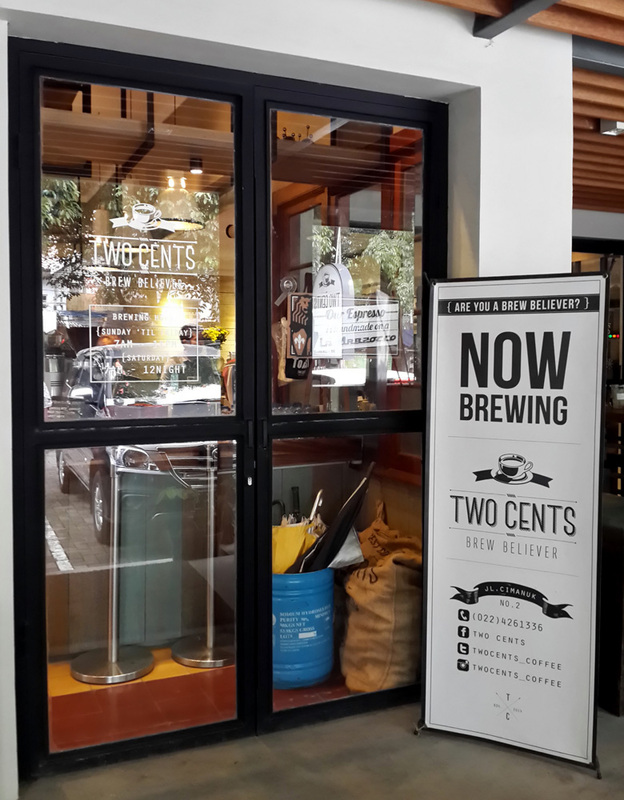 Two Cents Coffee is a nice small cafe around Jalan Riau (yes with all those Factory Outlets). To be precised, it is located on Jalan Cimanuk. If you are driving from Heritage Factory Outlet, turn left on the first road, then you will find Two Cents Coffee on your right. It was our second visit to Belitung, and we were so happy that now Aston Hotel is already opened. Having stayed at Lor Inn and Bahamas Hotel before, this time we wanted to stay at Aston. Yup the picture of the pool on their website looks very inviting. Compared to other two hotels that we had stayed before, this one is a very busy hotel. If you wish to stay in a peaceful area, this hotel is not the one you are looking for. We entered the huge lobby with a fishpond near the reception area. However, do not expect the same friendliness of the hotel staff as you might find in any other Aston Hotel. Something that Aston Belitung Management has to workout on. Are you looking for a place to stay with your family in Bali? Why not book a villa which consist of 3 bedrooms and a swimming pool via airbnb? When I saw the villa for the first time, I fell in love with it. 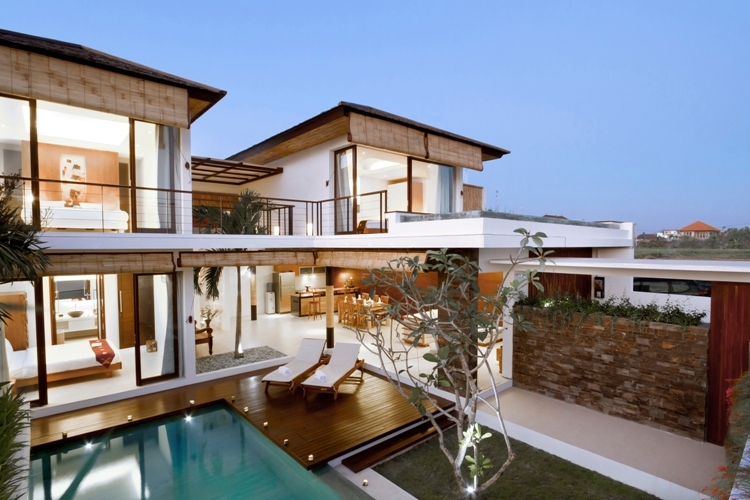 It's just perfect to stay there if we go to Bali with our parents. All the rooms are special with a view to the rice field, and one being only few steps away from the swimming pool. I guess, the room which connected to the pool will be suitable for our kiddos. To end our photo trip in Hong Kong that day, our friend Andi offered us to ride on a junk boat from Yau Ma Tei typhoon shelter. "Is it the same Yau Ma Tei with Yee Shun Milk company?" I asked Andi because I remember on our itinerary we'd like to try the famous milk pudding in Yau Ma Tei area. Andi looked at his watch, we were late for our lunch already. A tour to Stonecutters and Tsing Ma Bridge had made us skip our lunch. Maybe he thought I was asking the milk pudding because I was hungry:p "No, it's a different Yau Ma Tei" he answered. Then he continued, "Let's grab some fast lunch at MTR station and continued our journey to Yau Ma Tei". We had a take away Sushi at the nearest MTR station, then took MTR to Olympic MTR Station. We followed Andi to the exit and walk about 10 minutes before we reach Yau Ma Tei typhoon shelter. Then we saw the junk boats with an old man and a lady inside. "Look, those people live on the boat!" When I saw a plant on the top of the boat, I knew Andi was telling the truth. Upon arrival at Hong Kong International Airport, we took airport bus and sat on the second floor. It was early in the morning and we were amazed by the view of sunrise when we approached Tsing Ma Bridge, a bridge that connects two islands: Tsing Yi and Ma Wan. Tsing Ma Bridge is the world's largest suspension bridge that carries both road and rails traffic. So when you take the airport bus from the airport to Hong Kong or Kowloon, you will be passing the bridge. But if you take the Airport Express Train, you will go through the tunnel under the Tsing Ma Bridge. It is how sophisticated this bridge is. We were lucky that we have friends in Hong Kong who were able to take us around while we spend our weekend getaway in Hong Kong. Deasy and Andi have been living there more than 5 years, with all of their knowledge about Hong Kong, still they were in doubt where to take us that morning. I wanted to visit Repulse Bay and Shek O beach, but Andi suggest other thing: to see the view of Stonecutters Bridge. Then I remember passing that bridge and all the colorful container by airport bus. Suddenly the beaches sound less interesting, and I agreed to visit anti main stream tourist place: container in Hong Kong and the bridge. Andi is a professional photographer, his amazing pictures could be seen in his website https://andreas-images.com/. So it was kind of a photo trip around Hong Kong that day with Andi and Deasy. 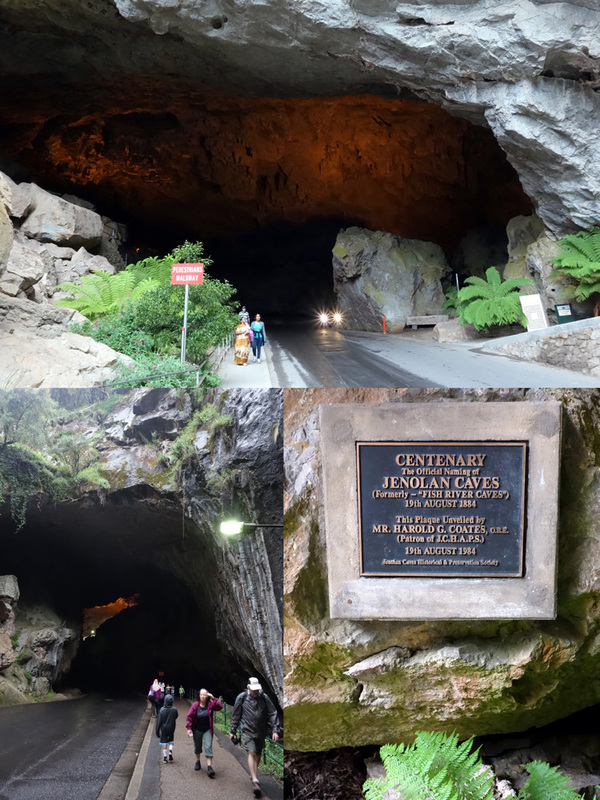 A trip that my husband Rene enjoyed so much. Mid Level Escalator Hong Kong was on my list on our first independent trip to Hong Kong, but it was raining every single day back then. We skipped the escalator, and visited 4 years afterwards. Time flies, really. The Mid Levels Escalator at Central Hong Kong is claimed to be the longest outdoor covered escalator in the world. But it was not my reason to try the escalator, I was interested in the surrounding areas near the escalator. Let me take you to our journey exploring Central to Mid Levels using their famous escalator. As one of Asia's shopping paradise, Hong Kong has so many areas for shopping. 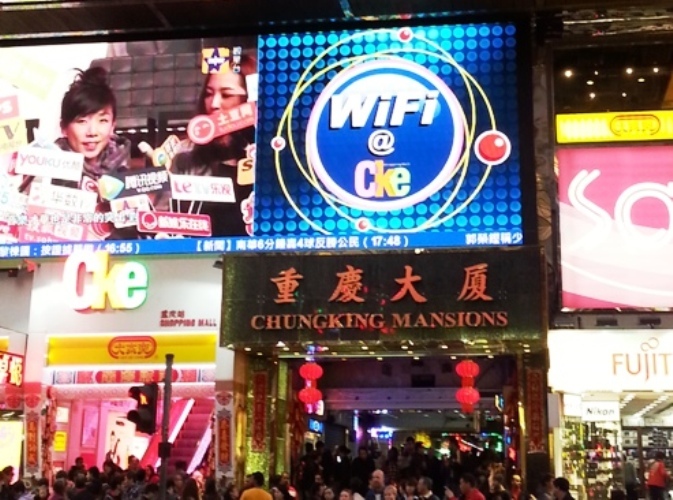 Tsim Sha Tsui, Causewaybay and Central are the three major shopping complex, and probably my fave is Central. One of the reason is because there's a huge Marks and Spencer store located in Queen Street. Marks and Spencer's price in Hong Kong is way cheaper compared to their price in Indonesia. To explore Central, Rene and me decided to explore the area by doing our own walking tour with GPS on our phone. We started our walking tour in Central by taking a tram from Western Market and alight at Pedder Street. The what so called "Ding-ding Tram" could only be found in Hong Kong island. You have to try this old tram to get "a real Hong Kong experience". Passangers get in from the rear door of the tram, and exit from the front door. One of the freespace area that you must visit in Hong Kong is the West Kowloon Waterfront Promenade, or also called the West Kowloon Cultural Park due to varieties of shows and festivals often held in this venue. Located within 10 minutes from MTR Kowloon Station, the park offers picnic area with a million dollar view, cycling and jogging track, and of course some playgrounds. This place is perfect to spend your quality time with the whole family. We walked from Queen Street and took the Mid Level Escalator. All of the sudden I wanted to exit the escalator. How lucky I was to find a halal certified Turkish restaurant between cafes and restaurant in SOHO. It is called the 27 Kebab House Turkish Restaurant. Have you ever imagined taking your family on a luxurious camping which has a bathroom in each tent with a hot shower? Indonesia has it! 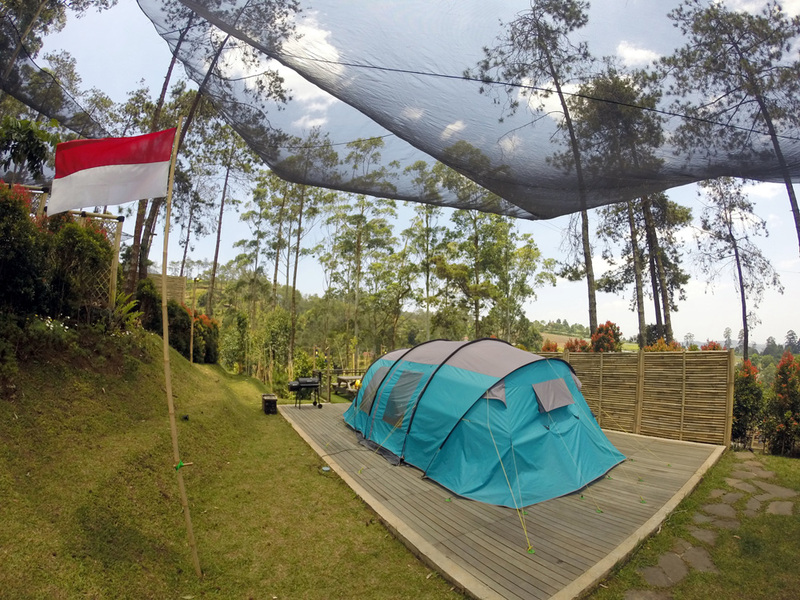 It is called Eagle Camp, a luxurious camping ground in Dusun Bambu, located in Lembang-Bandung. Having stayed in an executive camping ground near a beach in Tanjung Lesung, I'd like to take our kiddos to experience how it's like to camp in a cold area like Lembang. I brought jackets and long sleeve shirt for our kiddos, as I had no idea how cold Lembang would be these days. I booked 5 tents directly to the phone number provided in Dusun Bambu's website, yup I succeeded make other 4 families to join our glamping (glamour camping) this time. But too bad my friend @diniros cancelled so we ended up booking two single tents (IDR 1,700,000 for 2 person) and one double tents (IDR 2,750,000 for 4 person). Saya mengenal Anida (@nidnod) dari twitter-nya, ketika ia bercerita mengenai "career break". Istilah baru untuk saya saat itu, namun saya langsung menyukai konsepnya: break satu tahun dari kerja rutin dan mendapatkan working and holiday visa di Australia. Ketika kemudian saya melihat Anida tweet pic buku barunya Under The Southern Stars, waaaah... saya langsung ke Gramedia dan seneng banget menemukan buku Under The Southern Stars ini. Covernya sangat syahdu namun eye catching. Terlihat 4 pejalan berada di bawah bintang, duduk di atas mobil yang membawa mereka dari Perth menuju Melbourne. 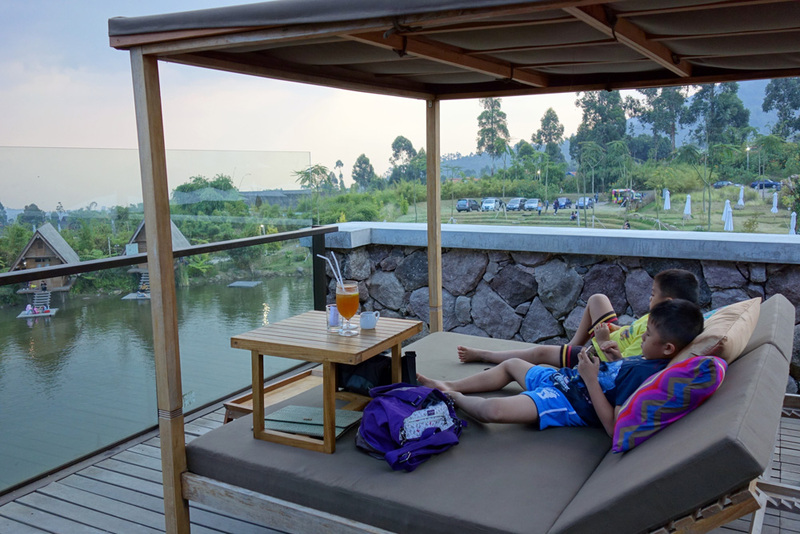 So you are visiting Bandung and wondering where you can relax at a restaurant while the kids enjoying the playground? I would recommend you to visit Miss Bee Providore, yes this restaurant is a (very) family friendly restaurant, a kind of resto that our kiddos remember its name from our first visit. 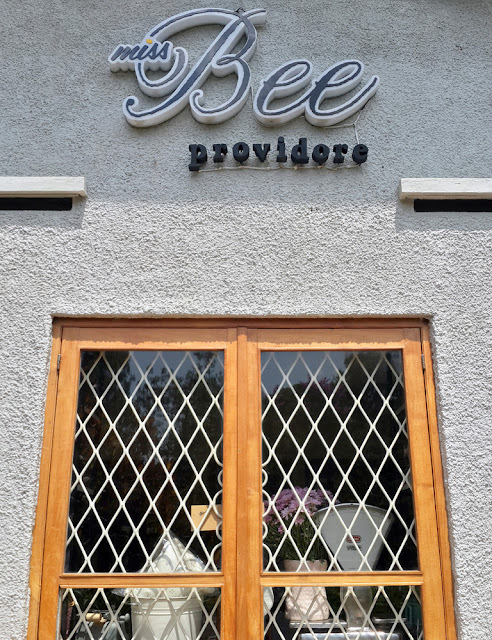 I knew Miss Bee Providere when @LiburanAnak tweet about their visit to this famous resto in the northern part of Bandung. From the tweetpics, this place is really interesting, so I planned a visit to Miss Bee. 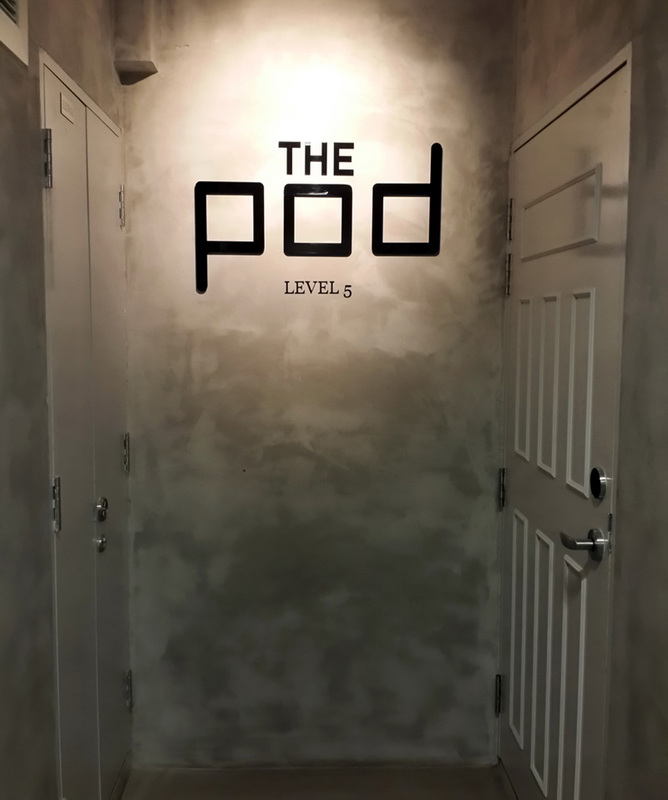 It was my first experience to stay at a capsule hotel, and I was lucky that the first capsule hotel that my wife choose was a luxury one:D It was The Pod Boutique Capsule Hotel in Singapore. Tesya came across The Pod when she was searching for a Singapore hotel in Agoda for me. Then we checked its website, and we both amazed by the pictures of the bed and also the price:p Anyway, we reserved one single pod for my night stay. We'd love to try how it's like to sleep in a luxury pod. Where to eat delicious steak with affordable price in Surabaya? My friend introduced me to Bon Cafe, he said that the steak at Bon Cafe is recommended. 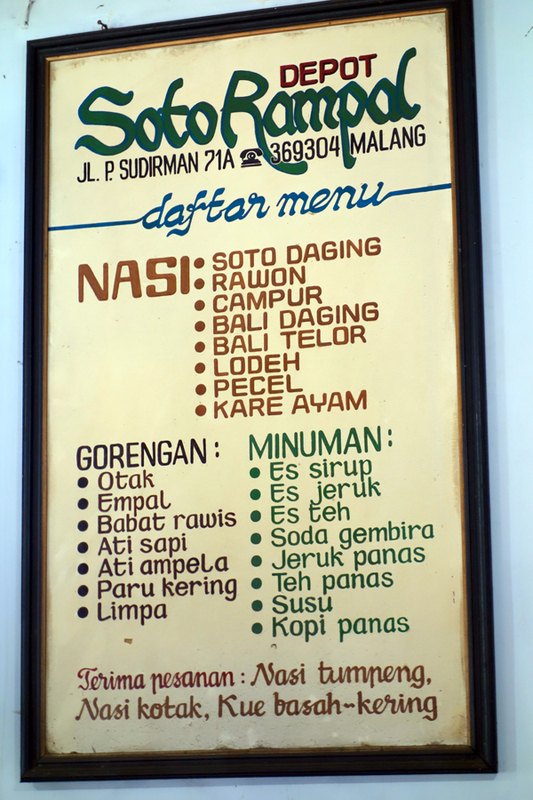 I tried once, and now the resto is on the top list of "my must visit place" in Surabaya. Aside from the steak, I like the ambiance of the resto. Yes, including a very classic red and white table cloth. The last time, we visited their branch at Jalan Raya Kupang Indah for dinner. 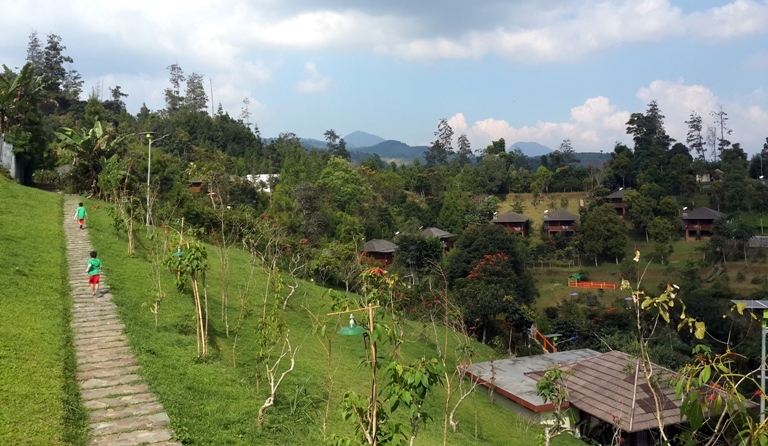 Although there are so many hotels in Lembang you can choose to conduct a meeting or an office outing, still it was confusing to choose the right one. I was surprised that my friends had chosen Kastuba Resort for our what so called "family day" this year. After spending a half day at Lembang Floating Market, we went to Kastuba Resort. It took about 20 minutes from Lembang Floating Market. We passed "The Ranch", and continued following the road guidance from "Waze". When we arrived at Kastuba Resort, a hotel staff approached our car, took our luggage and asked whether we would take the shuttle or just walk to the resort. Knowing that they only has one Toyota Avanza for their shuttle, we choose to walk. The greenery welcomed us. And that moment I knew we were going to love this resort. It was the first time in Medan that my friend took me to a place for a durian party called Ucok Durian. I don't like durian that much, but I really enjoyed the ambiance at Ucok Durian. 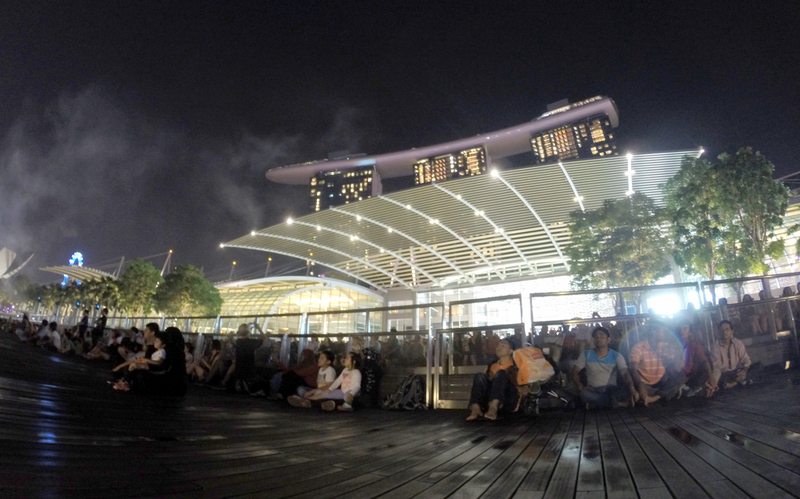 It's an outdoor place where you can hangout with your friends enjoying tons of durian! I was amazed by how hectic Ucok Durian was that night. "When it is too crowded, Bang Ucok will open another place" my friend told me while pointing to a shophouse located just across the street. Well, Bang Ucok is really good in doing his business. I have several posts on tesyasblog regarding my fave place to eat Bandung's noodle which is called "Mie Baso" and "Yamin Baso". My fave so far is Mie Baso Panghegar, but I have heard about the famous place called Warung Lela or Wale located at Dago area from many years ago. I've never had the chance to visit Warung Lela, until our cousin had a wedding party at Jalan Tubagus Ismail Dago. Before we started the party around 3 pm, I and Rene went to Warung Lela. We arrived at 11.30 am and found Warung Lela was not yet so crowded. When I got in, I suddenly fell in love with this place. 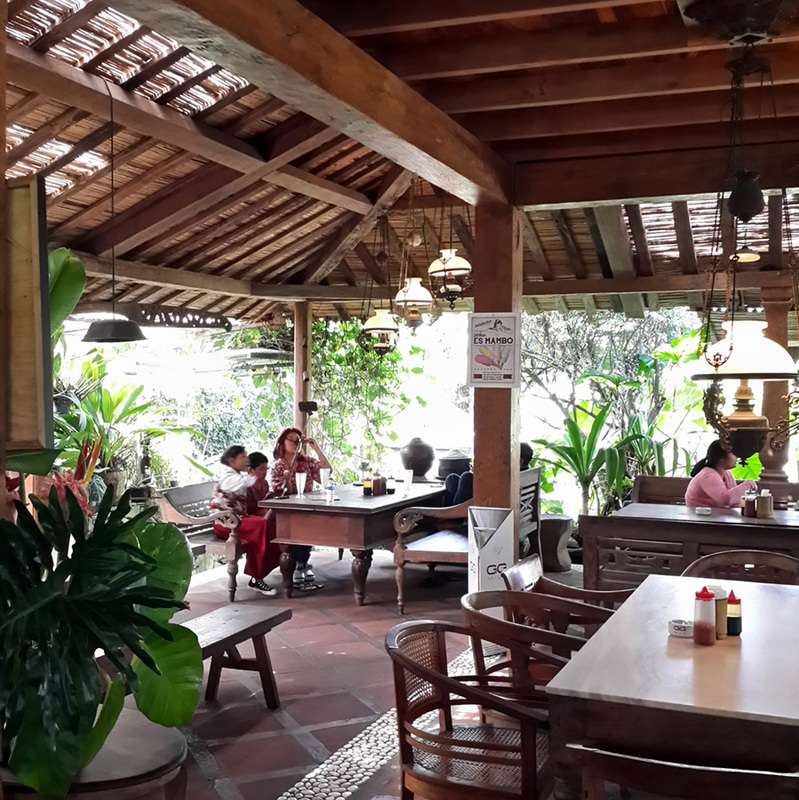 The woods made this place so homey, and the fresh air at Dago is a perfect match with a hot noodle soup. Where to stay in Weh Island (Pulau Weh) of Aceh? I have reviewed several places previously, and it was a surprise for me to find another great place called Anoi Itam Resort, recommended by a friend of mine, Pak Hermawan. He said that Anoi Itam is the best place for sunrise lovers in Weh Island. I started to search on google how the resort looks like (because I took my friends to Weh and I didn't want to disappoint them), when I found out that the icon of the resort was the gazebo near the beach area. The hotel looks like really nice, and I decided to book one night at Anoi Itam Resort. Do you love snacking? I do, and I love to try those new snacks in town:) When my friend @zkhairi opened his first outlet of Grab & Go in ITC BSD, I was really happy to become one of the tester. I love chicken pop corn! Grab & Go provides chicken pop corn with french fries in a cute box. A box which will remind you to Chinese Food delivery in American movie. I think beside the taste of chicken pop corn and french fries, the box is also the selling point of Grab & Go. 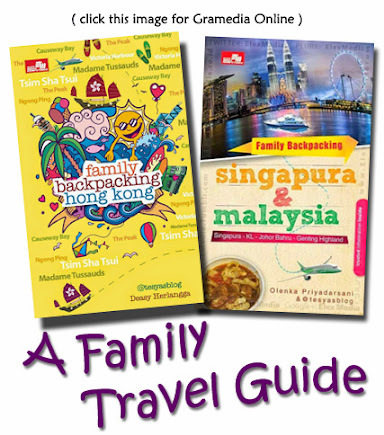 Saya mengetahui bahwa Febbie dari @jalan2liburan atau yang biasa saya panggil Kak Feb sedang menulis sebuah buku ketika saya dan lima traveler mommies tengah menyusun buku #keckeckeldu. 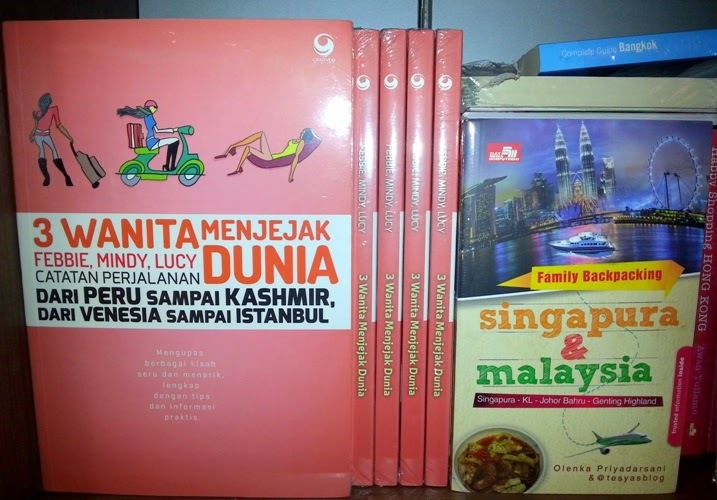 Kala itu Kak Feb hanya menjelaskan secara singkat bahwa ia tengah menggarap buku traveling bersama Mindy (@mindoel). Later on ketika bukunya sudah terbit, baru saya tau bahwa buku ini ditulis bertiga dengan Luci (@luciana707). 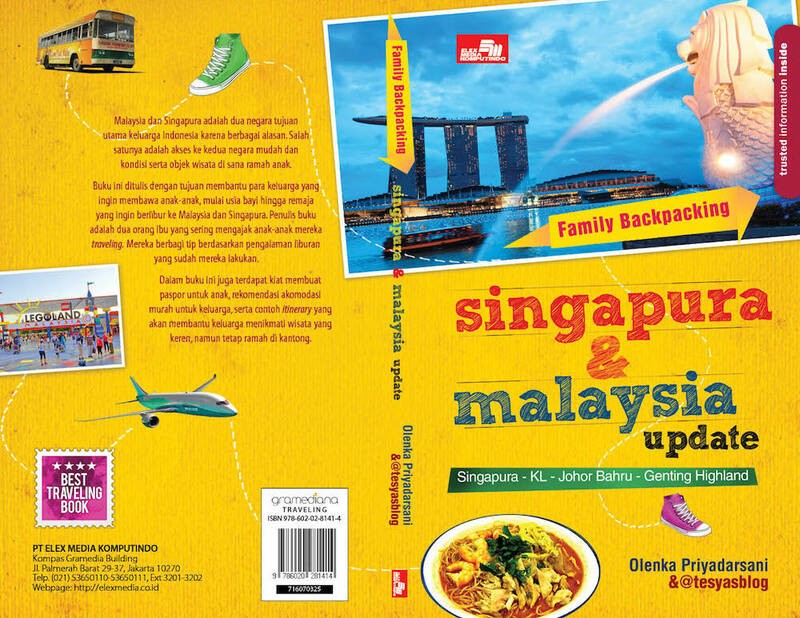 Ketika saya tanya buku traveling tentang apa, Kak Feb menjawab "Buku inspirasi traveling, kami cerita tentang tempat yang sudah kami singgah" Saya pun tertarik, mengingat tempat yang dikunjungi Kak Feb memang selalu fenomenal. Begitu yang saya lihat di instagram jalan2liburan, ataupun di blog nya. Waktu berlalu, ternyata buku 3 Wanita Menjejak Dunia terbit lebih dulu daripada buku #keckeckeldu. Saya langsung membeli bukunya, dan dari covernya aja saya udah suka banget. Feminin karena pinky, ada tiga gambar wanita, dan sub-judulnya donk.. "Catatan Perjalanan dari Peru sampai Kashmir, Dari Venesia Sampai Istanbul". I was looking for a private room in a hostel near Central Station of Sydney when I came across The Big Hostel on booking.com. Although we are backpackers, when it comes to choose whether to stay at dorm or private room, I always choose the private room, despite of the price. I did it once staying separately: Rene at a mixed dorm and I stayed in a female dorm. Ended up we had to share the toiletries, and worried will we be able to wake up on time the next morning? 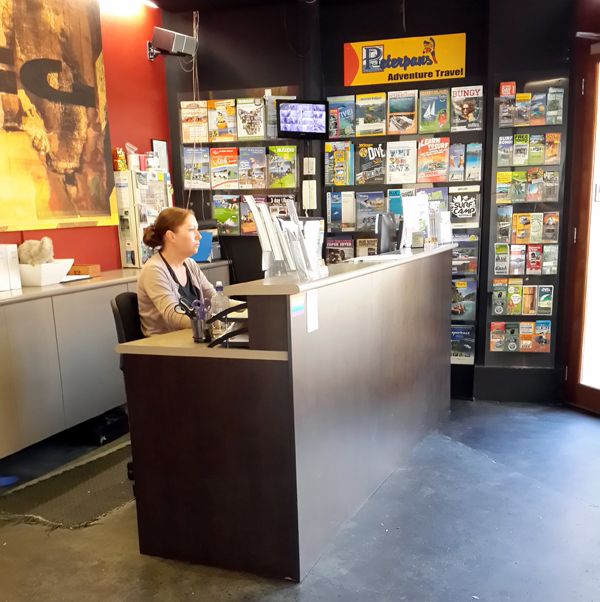 There are several hostels near Central Station: YHA Railway, YHA Central, Bounce Sydney, Woke Up Hostel, and many more. But I choose the Big Hostel because they had a private room available for AUD 110 per night. 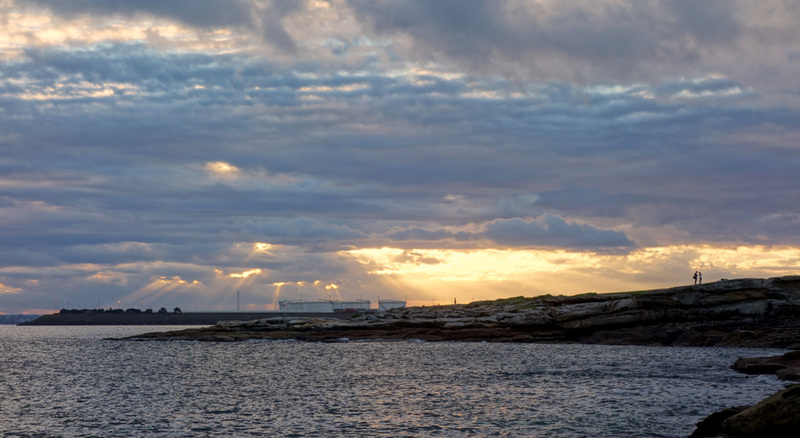 We didn't have the chance to go to Sydney Fish Market on our first visit to Sydney, therefore on our second visit, it was on the top of our itinerary. 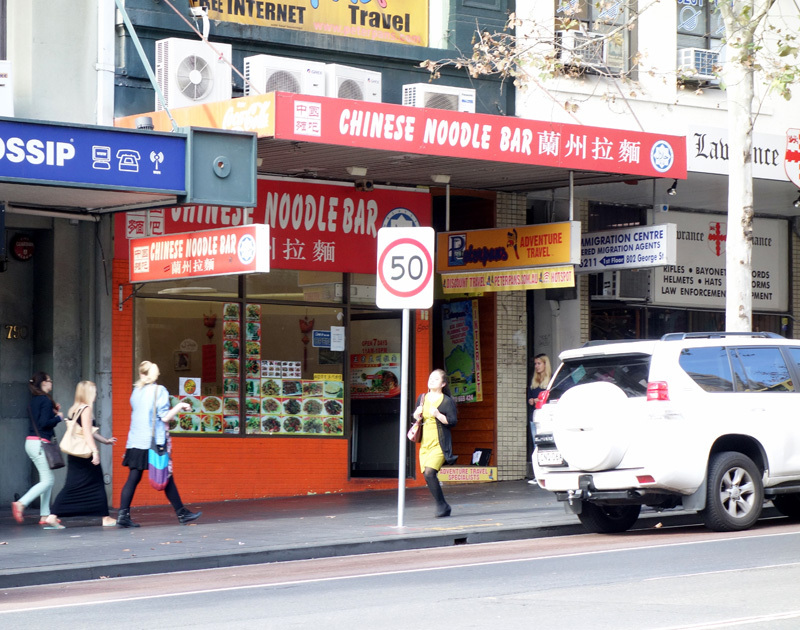 We took light rail from Paddy's Market and alight at the Fish Market. We followed the sign from the light rail station to the fish market. It was only about 5 minutes walking from the station to the market. 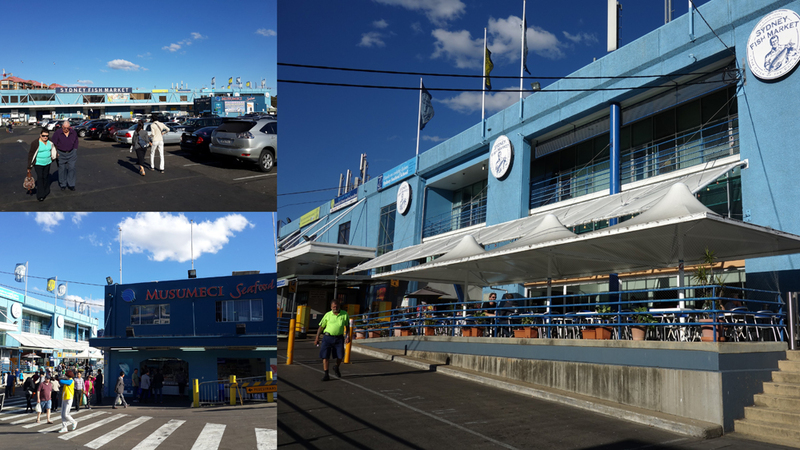 The first thing we saw was the parking area and some seafood shops and restaurants. 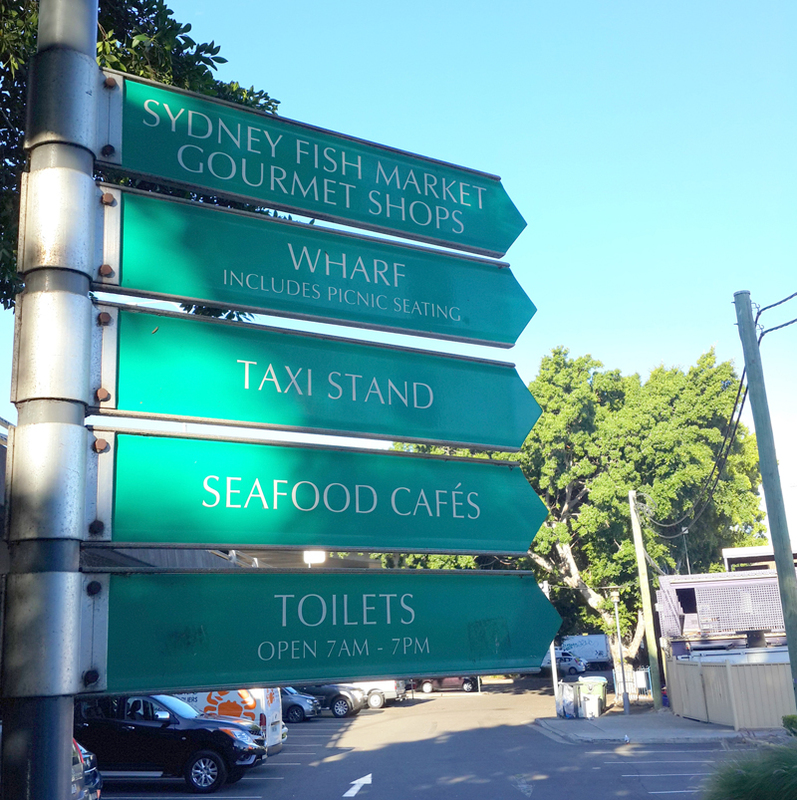 We were not sure which restaurant to choose, so we just walked approaching the blue building with the sign of "Sydney Fish Market". 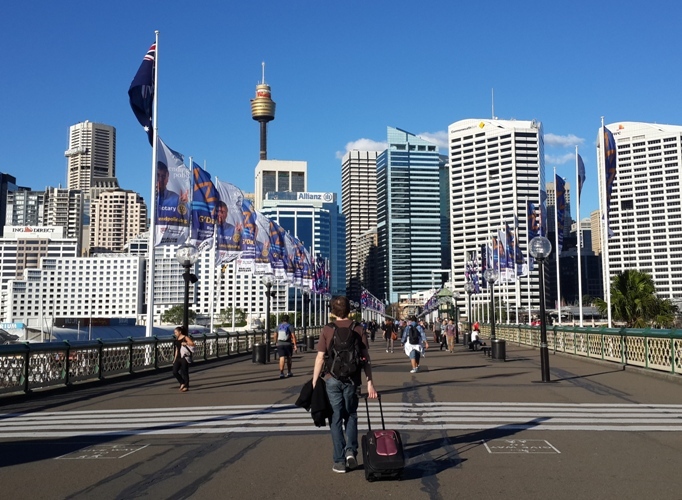 It was indeed a challenge to look for a hotel with maximum AUD 100 per night at Sydney CBD, especially during the Vivid Sydney festival. 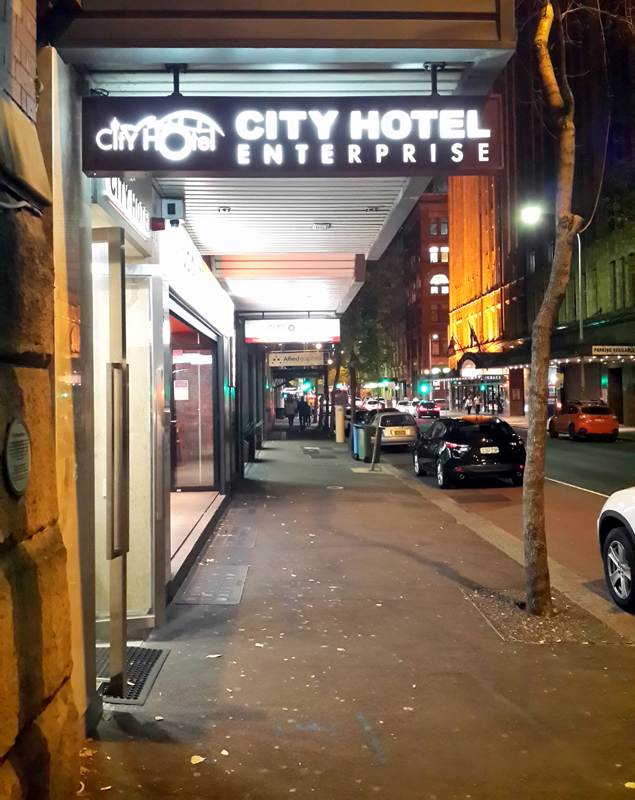 As always, I searched for a hotel via booking.com where I came across a budget hotel called City Hotel Sydney. At the moment, the hotel is changed to Breakfree on Clarence Sydney. When I further read the review on tripadvisor, I was very sure that this hotel was "the one". 5 minutes to Queen Victoria Building which is linked with the Town Hall train station, 5 minutes to Darling Harbour (from Market Street), and it has an en suite bathroom. 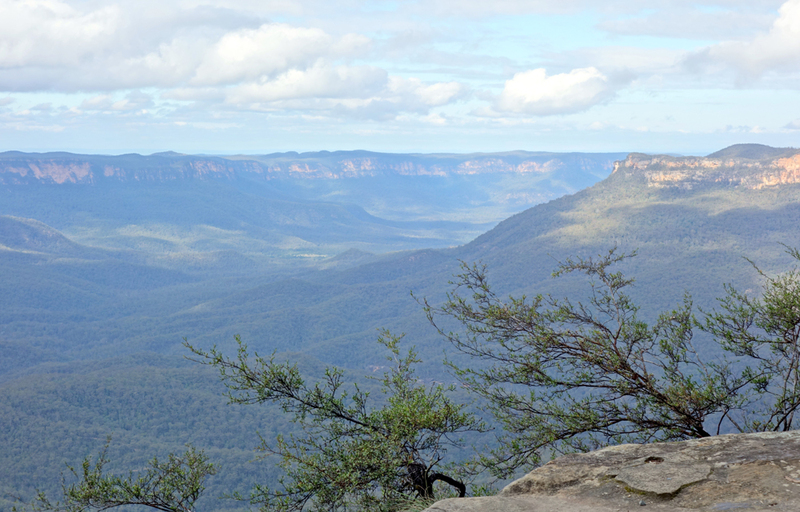 Other than that, the room price is AUD 109 per night, with a "pay later and free cancellation" option. 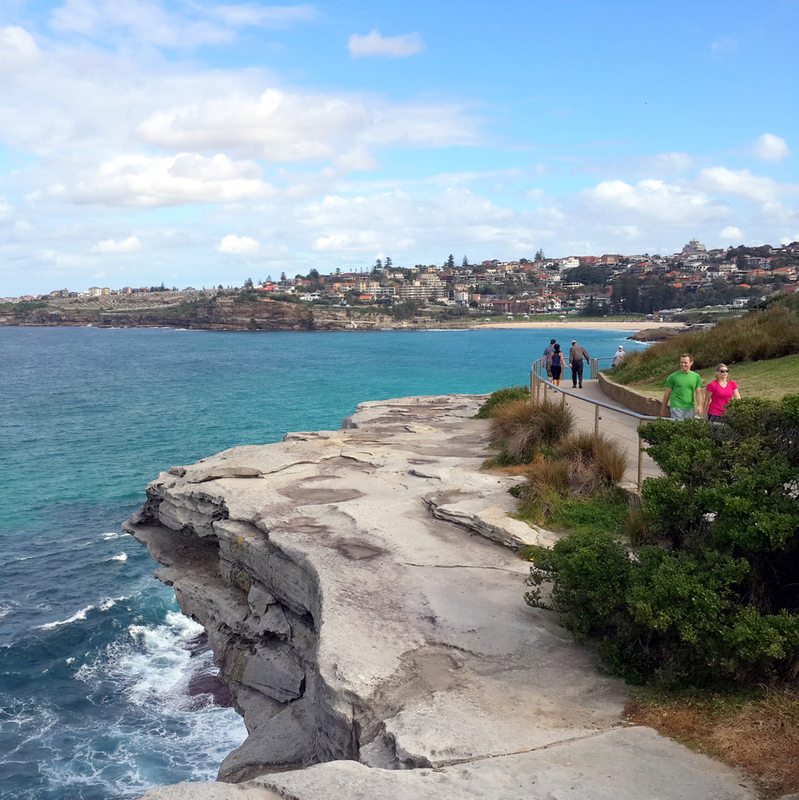 Posting ini saya tulis untuk pembaca tesyasblog yang menempatkan Sydney sebagai lima besar dari travel bucketlist-nya. Sydney yang ketika mendengar namanya terkesan "mahal" (eh, bukan kesan aja sih, emang mahal!) dan mewah, ternyata bisa dinikmati dengan cara backpacking juga loh! 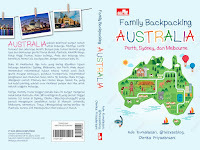 Ini hal utama yang harus didapatkan jika merencanakan backpacking ke Sydney: tiket pesawat yang murah. Kami membeli tiket pada saat Air Asia X Sale bulan Oktober 2013, seharga Rp 8,7 juta untuk dua orang PP. Pas banget sih waktu kami lihat tanggal kalender, pada bulan Mei 2014 ada dua hari libur dalam satu minggu. Dan pada tanggal tersebut, ada Lights and Music Festival Vivid Sydney. I love night market. All the lights and colors of the market give me the energy even if I have spent a whole day exploring the city. When I heard that Bangkok has a night market called Asiatique - one place which has not been exist yet on my previous visit - I put it in my itinerary. This place remind me a lot to "the old Clarke Quay" in Singapore. Both are located at the riverside, has many shoppes and very happening. Now Clarke Quay filled up with many cafes and bars, while Asiatique is a touristy place with its ferris wheel, shoppes, cafe and restaurants. I heard it many times that visiting Bangkok without shopping at Chatuchak is not complete. On my first and second visit to Bangkok, I didn't have the chance to visit Chatuchak. Maybe that's why I had the opportunity to visit Bangkok once again. And this time Chatuchak was number one on my itinerary. We left Bangkok City Hotel at 7.30, took the BTS to Mo Chit station, and found many buses and taxis once we exit the BTS station. It was Saturday morning and many people coming to Chatuchak. We just followed the crowd from BTS to Chatuchak. I was sure that everyone was heading to Chatuchak that morning. I came across Bangkok City Hotel when I searched through booking.com for hotels around USD 50 in Bangkok. Other thing which was a plus point: Bangkok City Hotel also has a triple room, perfect for our group which consist of 5 people. We could reserve one double and one triple room. I reserved the room directly through their website. The hotel only charged the room one week prior to our arrival. Tripadvisor reviews for this hotel is also positive. There are reviews saying that many halal food stall are available around the hotel. I wanted to proof it by myself. Ini kali ketiga saya berkunjung ke Bangkok. Terus terang, ide awalnya karena menerima newsletter dari Tiger Mandala mengenai Return for Free Promo Ticket. Karena saya tau Rene kurang tertarik dengan Bangkok, saya pun berinisiatif mengadakan another tesyasblog's Mommies Day Out Trip. Awalnya saya mengajak lima orang teman kantor, berkembang dengan tambahan dua group lainnya, peserta menjadi 12 orang! Sayangnya satu group yang berisi 4 orang mengundurkan diri, karena ada satu peserta yang hamil. Akhirnya kami menjadi dua group, 5 orang saya dan teman kantor, serta satu group sahabat saya @rona_willis beserta dua teman lainnya. Berapa biaya liburan ke Bangkok? 1. Tiket pesawat: Rp 1,3 juta PP, tanpa bagasi. 2. Hotel dua malam Rp 500,000 (per orang). 3. Transportasi, makan dan belanja : THB 4.000 (sekitar Rp 1,5 juta). Saat itu 1 THB = Rp 358.